Las Vegas Ballpark! Home of the Aviators! The name, Las Vegas Aviators, pays homage to the Howard Hughes Corporation's namesake and Southern Nevada's rich history in aviation. 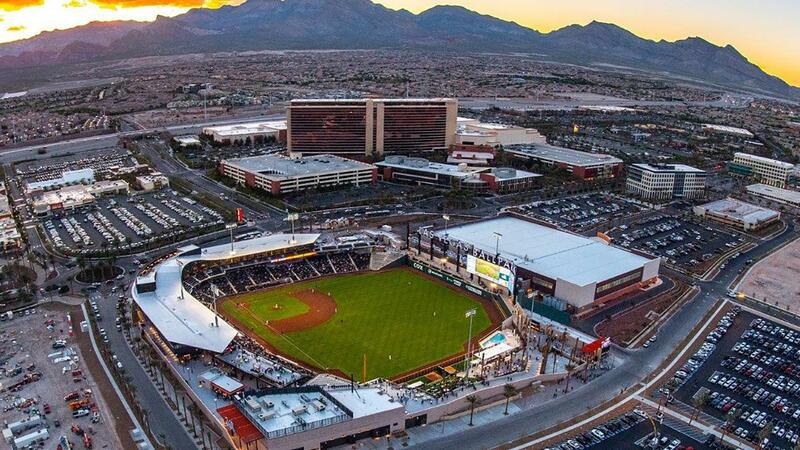 Las Vegas Ballpark is a state-of-the-art stadium, located in the vibrant environment of Downtown Summerlin. As our hospitality partner, PSC's parent company, Levy, adds to its strong portfolio in the Las Vegas area, including T-Mobile Arena. The Las Vegas Aviators, in conjunction with the Oakland Athletics, have announced the 2019 Triple-A Las Vegas Coaching Staff. Las Vegas announces a two-year Player Development Contract (PDC) with the Oakland Athletics through 2020. Las Vegas Ballpark website - CLICK HERE! Las Vegas Aviators Nickname & Logo Information CLICK HERE! Click here for the 2018 Las Vegas Final Season Notes! Mark Payton was named PCL Player of the Week! Las Vegas Ballpark "Construction Cam"
2019 Home Schedule in the new Las Vegas Ballpark! July 3rd - Fireworks Extravaganza - All-You-Can-Eat Deal! "Final Game" in the history of Triple-A baseball at Casman Field - 9/3/18!